Many people are obsessed with avoiding carcinogens. 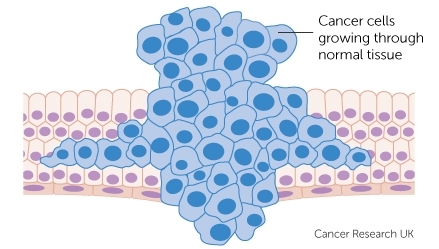 But what makes cancers grow may be just as important as what gets cancer started. T. Colin Campbell and Thomas M. Campbell II argue that what food we eat can make a difference for how well cancer grows. In this post, I don't want to put too much emphasis on the particular dietary danger they discuss; I mainly want to emphasize that what fuels the growth of cancer is just as important a question as what gets cancer started. Let me quote from Chapter 3, of their book The China Study: "Turning Off Cancer." First, on pages 40 and 41, they delineate three stages of cancer: initiation, promotion, and progression. At this point in our lawn analogy, the grass seeds have been put in the soil and are ready to germinate. Initiation is complete. The second growth stage is called promotion. Like seeds ready to sprout blades of grass and turn into a green lawn, our newly formed cancer-prone cells are ready to grow and multiply until they become a visibly detectable cancer. This stage occurs over a far longer period of time than initiation, often many years for humans. It is when the newly initiated cluster multiplies and grows into larger and larger masses and a clinically visible tumor is formed. But just like seeds in the soil, the initial cancer cells will not grow and multiply unless the right conditions are met. The seeds in the soil, for example, need a healthy amount of water, sunlight, and other nutrients before they make a full lawn. If any of these factors are denied or are missing, the seeds will not grow. If any of these factors are missing after growth starts, the new seedlings will become dormant, while awaiting further supply of the missing factors. This is one of the most profound features of promotion. Promotion is reversible, depending on whether the early cancer growth is given the right conditions in which to grow. This is where certain dietary factors become so important. These dietary factors, called promoters, feed cancer growth. Other dietary factors, called anti-promoters, slow cancer growth. Cancer growth flourishes when there are more promoters than anti-promoters; when anti-promoters prevail, cancer growth slows or stops. It is a push-pull process. The profound importance of this reversibility cannot be overemphasized. The third phase, progression, begins when a bunch of advanced cancer cells progress in their growth until they have done their final damage. It is like the fully grown lawn invading everything around it: the garden, driveway, and sidewalk. Similarly, a developing cancer tumor may wander away from its initial site in the body and invade neighboring or distant tissues. When the cancer takes on these deadly properties, it is considered malignant. When it actually breaks away from its initial home and wanders, it is metastasizing. This final stage of cancer results in death. The most significant finding of this experiment was this: foci developed only when the animals met or exceeded the amount of dietary protein (12%) needed to satisfy their body growth rate. That is, when the animals met and surpassed their requirement for protein, disease onset began. Also see the last section of "Five Books That Have Changed My Life."